I chose to create a journal on my maxjournal app for this challenge. Why? Well, I've compiled so much into this IPad so that it functions as a one way stop to keep me from cluttering my handbag with several notebooks as I have done in the past. The picture shows the cover of the journal. I have several statements I want to place here to keep them fresh on my mind. - no matter what, you better strut. -Mikhail Baryshnikov : "I do not try to dance better than anyone else. I only try to to dance better than myself." 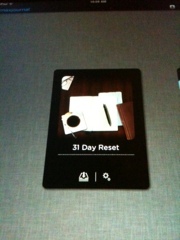 I'm excited we're both doing the #31dayreset at the same time! We can encourage one another! I'm also excited to read more of your blog...you're in my Google Reader now! !